The Upward Facing Two foot staff pose is Dwi Pada Viparita Dandasana considered to be one of the more complicated and advanced poses in Yoga and is primarily focused on opening the chest as well as improving the overall strength of the chest and the spine area. This asana must be performed on an empty stomach. You must have your meals at least four to six hours before you practice yoga. You must also make sure that your bowels are empty. Not recommended for pregnant women, those suffering from insomnia, or those with back, neck, or shoulder issues. Sleep flat on your back and with your heels below your knees and place your feet slightly wider in comparison to your hips. Slowly allow your arms to bend and place the palms on the floor right besides your ears. Make sure that your finger tips face the shoulders. Once you achieve this, stay in that pose and shift your focus on your breathing. Slowly exhale and push your knees in the direction away from the torso. As you do this, lift your shoulders, hips and head off the floor and let your arms be straight. Let the shoulder blades move towards the tailbone as this will relieve the pressure on the arms. Slowly let the crown of the head rest on the floor while you keep the elbows apart. As you exhale again, let one hand pass the ear to hold the behind of the head and let the weight be on your forearm. Do the same with the other hand. Exhale powerfully and loft your chest so that your head is raised off the floor. As this happens allow your heels also to be pinned to the ground. Stay in this pose for sometime. In the full pose let the feet be away from your hands, till the legs become nearly straight. Once achieved let your head back on the floor, with your elbows pinned to the floor as before. Let your middle back extend more deeply. As you move out of the asana, make sure that you do it carefully. Place your feet below your knees. With the head on the floor place your palms on the floor next to your ears. Make sure you have your hands under the elbows. Slowly roll down to the floor and slow down your breathing, till it returns to normal. If you are a beginner make sure you have a trainer to guide you with the pose. You can make use of a yoga mat to help you perform the pose well as it provides support to your arms. To deepen the pose, straighten your legs and reach your chest away from your feet. It is best that you consult your trainer on variations to the Upward Facing Two Foot Staff pose. You could use the yoga mat or other yoga props as suggested by your trainer. If you have a fat belly and want to get rid of it, then this your perfect solution. Including Dvi Pada Viparita Dandasana into your daily yoga routine will also strengthen your shoulder muscles. This yoga posture opens up one’s chest and provides better mobility to the spine and shoulder blades without straining the body. This exercise helps in building emotional stability and also boosts up your self-confidence. 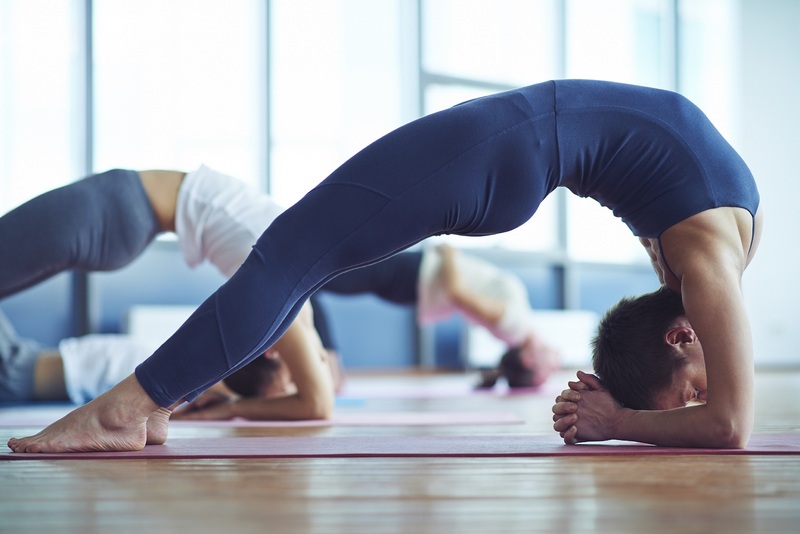 If one has displaced bladder or prolapsed uterus, then this posture of yoga can set it right. It also helps in relieving menstrual cramps and other symptoms of menopause.